(SEOUL) December 22, 2015 – Kia Motors is getting ready to unveil a special, one-off X-Men-inspired Sportage CUV as part of its ongoing collaboration with Twentieth Century Fox and the X-Men movie franchise. The 2nd generation Kia X-Car has been created to promote the new X-Men: Apocalypse film and Kia's sponsorship of the Australian Open 2016 tennis championship. Inspired by X-Men character Mystique, the 2nd generation Kia X-Car mimics the appearance and powers of the famous shape-shifter. Fans of the X-Men film franchise and Kia Motors are invited to watch the Kia X-Car shape-shift in a special on-line video starring Kia's 'superhuman' global brand ambassador Rafael Nadal by visiting https://www.allaboutsportage.com/ from January 4, 2016. 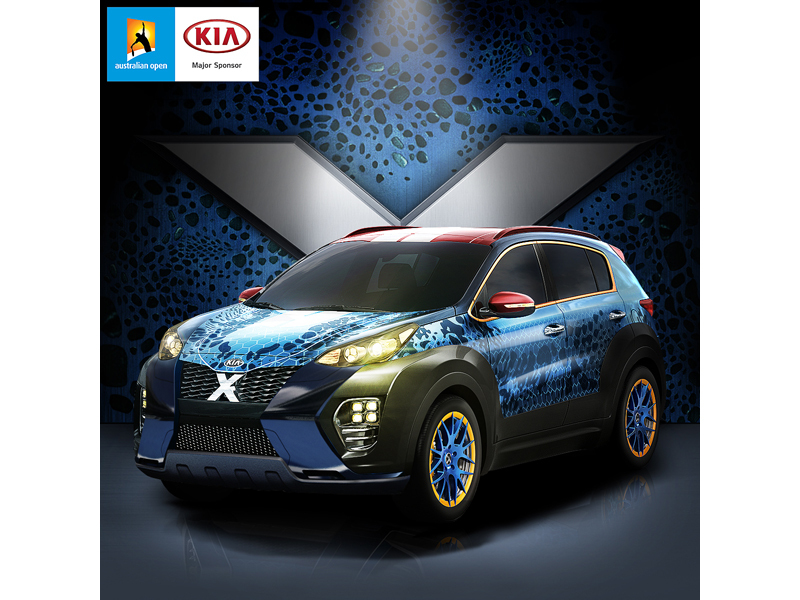 The Sportage, driven by Rafael Nadal in his efforts to take on the X-Men's arch-villain Apocalypse, transforms from its standard state, shapeshifting into custom-designed bodywork with special textured 'tone-on-tone' matte and gloss blue paint finish, racing wheels and tires along with red and yellow bodywork highlights. Ahead of the X-Men: Apocalypse's global release in cinemas in May 2016, the brand will take the covers off the new car in Melbourne, Australia before the start of the the Australian Open 2016 in January and will display the show car to the public at Melbourne Park throughout the tournament (January 18-31) before making appearances at various international motor shows and fan events in the run up to the film's premiere in May 2016. The Sportage-based Kia X-Car is the company's second show car project in collaboration with Fox, following the Wolverine-inspired Sorento that was shown at the Australian Open 2015 earlier this year. The all-new Kia Sportage production model was revealed earlier this year, building on the global success of the best-selling outgoing model with an attractive, all-new exterior design, a host of advanced new technologies and enhanced quality. The all-new Kia Sportage will go on sale in overseas markets in early 2016.